Vernacular architecture (aka. traditional architecture) is a topic we are going to be referring back to often. “Looking back before moving ahead” is a principle that any sustainable designer should cherish. Not only are our communities’ histories informative, they are also treasures that can enrich our lives. We all can choose to become part of the great story of our community, and leave it stronger. In Part 1, I began illustrating why we should think of historic vernacular architecture as the “original green” in our communities. I believe that we can always create more sustainable places by first stopping and reflecting on the historic roots of our community. If we use the best ideas from the past, along with today’s technology, we can create some truly awesome architecture that just feels right in our towns. He illustrates each of these climate areas' effects on proper solar orientation, air movement, sites topography, and materials. 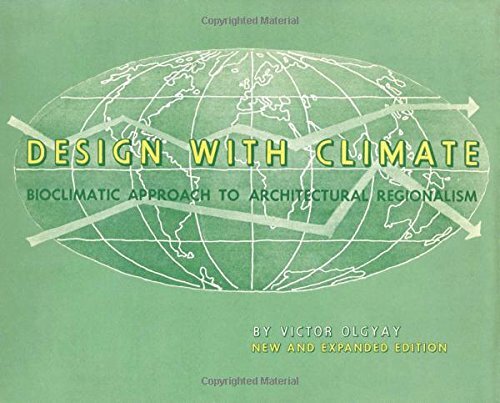 Written in 1963, his guidance still serves as a touchstone to many interested in designing climate specific buildings for greater human comfort. Resilient design and traditional architecture go hand in hand. Resilience is the ability of a building to withstand the climate in which it is built. Vernacular construction methods primarily used local resources and craftsmanship in their construction. Because everything was at the ready, transportation energy expense was minimized in moving building materials to their new resting place. Further, sourcing natural, locally-produced materials means you are supporting the local economy. Definitely a win-win! Vernacular buildings evoke a sense of belonging, and seem aesthetically fit for the places the stand. This stems from local earth and timber themselves being well-integrated into the local ecosystem. Cypress lumber does well when exposed to water, as it grows in southern wetlands, just as the red clay brick of the south holds up well in the hot-humid conditions of it’s origin. This is a big topic and a lot of fun to consider. It is unfortunate, that most construction today seems to give so little regard to fitness of materials for place. There is a lot of room to learn from the past. The Resilient Design Institute has a list of Resilient Design Principles is a great place to get a sense how vernacular architecture is resilient is almost every way. Studying your area’s vernacular architecture may contain the cure for community placelessness, cookie-cutter housing, and new development that looks like Everytown, USA. It can also help remind us of the “principles of place” on which your community was founded. In new construction and development, being true to place will lead to much greener solutions. This may mean implementation of land-protection policies, such as Natural Resource Protection Zoning, written to maximize a community’s unique sense of place. This kind public policy is not about limiting development, but rather creating the right balance (and form) that creates the right fit between your community and the natural surroundings. Policy is an effective way to limit unsustainable actions such as radical grading of land, limiting asphalt oceans, and high-percentage tree removals. Community members and native habitats both stand to gain from this action. In revitalization of the historic district and other neighborhoods, we should continue calling reference to sense of place. Usually, things have been muddled under a couple layers of <insert yuckiest color> paint from the Home Store, and sidewalks have been neglected. There also modern issues we need to assess periodically, such as how to park more cars than originally planned. For both new and old places, we should try to immortalize the best parts of the original landscape the, our vernacular architecture, and simple old school rationale. Visualize the untouched landscape, and early townspeople flowing along the first neighborhood sidewalks and downtown Main Streets. In revitalized communities, regaining independence from the automobile, you can see this kind of magic happening ...just watch. In a strong community, when we face challenges, we know that we can turn first to our left and right. Caring for our neighbors’ well-being is just as important today as when our community was first established. A natural extension to this is caring for the places that make up your community, too. Everyone benefits! Revitalization is a process that only happens through integral community support. Most Main Street America™ communities began with grassroots movements. This type of community-driven redevelopment is the essential factor for building a stronger, more vibrant heart of town. If your historic district is not already thriving, they may be only on the cusp of renewed greatness. Remember, they were built with life in mind, and built to last. Are the historic homes in your town well cared for? Do you have a thriving Main Street district, filled with businesses? If you do, then you probably understand how a strong sense of place (& community pride) feels. Revitalization makes this happen. Once your town's historic identity is secure, it becomes easier to approach revitalization and redevelopment in areas a little further out. But, don't let this idea hamper your desire to improve your own home and neighborhood today. Loving your own home, neighborhood, and the historic downtown are equally important in creating your own Green Heart Town paradigm. Older homes, neighborhoods, and downtowns are built traditions that we can learn from today. If we consider our vernacular traditions, stay close to the land, and utilize the best technologies from today, we would realize a brand new vernacular architecture. If we look back, our historic vernacular architecture offers low-tech solutions to common challenges today. Maybe we will see places they built with more grace then? Technology is our friend in sustainable design for our communities, but alone it is devoid soul. The old school rationale promoted aesthetics suited to place, local economic development, planning for people not cars, resiliency, and legacy. The sum of these historic ideals, may prove that the historic district is still the greenest neighborhood in town. What do you think? In any case, this original green, intuitive development, and light footprint, should not be forgotten. Looking ahead in the blog, we will consistently look back at the old ways before diving into the modern and high-tech. In doing this, we will peel back the principles of green architecture to the beginning and find the truth about sustainable design. Before you know it, I hope you will begin to see that many places you already inhabit were built sustainably. I hope the blog will inspire you to make these places even greener - from the inside out. This became a much larger topic than I prospected a couple weeks ago. I now understand more clearly how vernacular architecture affects place-based design in our communities. In creating a Green Heart Town, the idea of looking back at our vernacular traditions before moving ahead is a definite principle in the process. I would love to hear your feedback and any other ideas to add to the list above. We will be circling back to refer to this down the road, and referencing this principle for stronger, place-based design. Newer PostExisting Buildings are Green: Do They Energize You Heart?